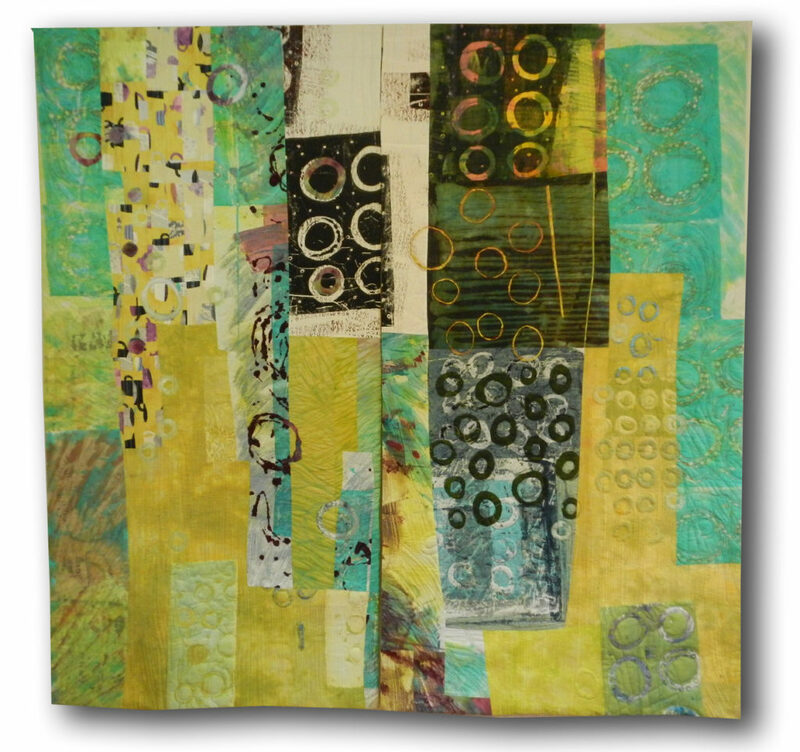 Pat Pauly is a recognized textile artist and fiber art teacher. 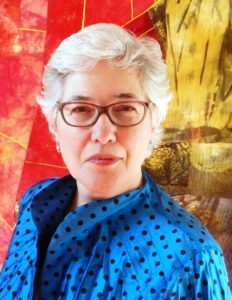 Her art quilts have been featured in numerous publications and exhibitions, seen in exhibitions internationally, and is in private and corporate collections. 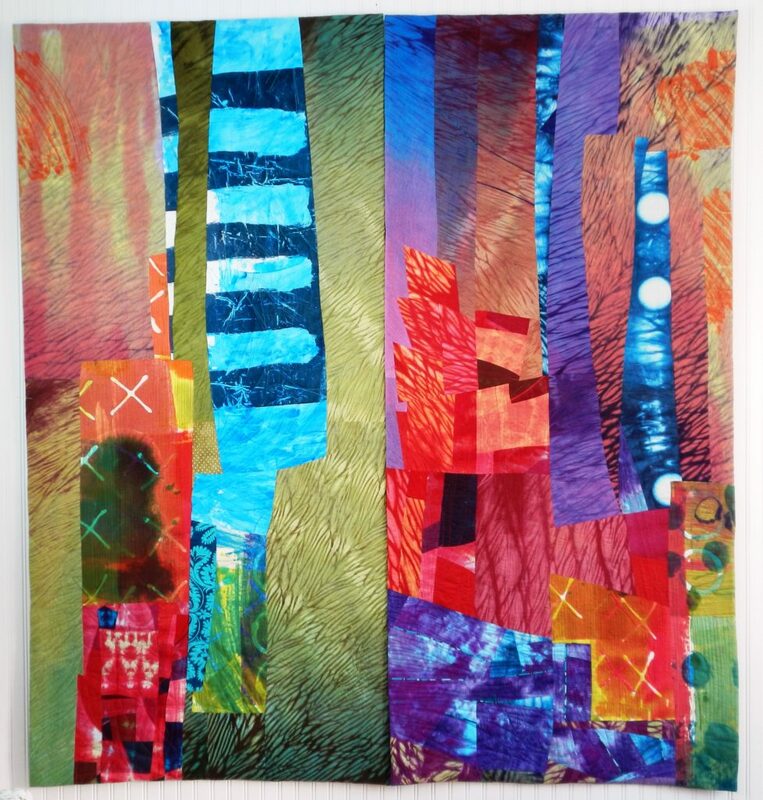 Known for her improvisation technique, Pat uses bold colors and unusual juxtapositions of fabric printed and painted by her personally, to create energetic and spontaneous artworks that have much in common with the pictorial arts. 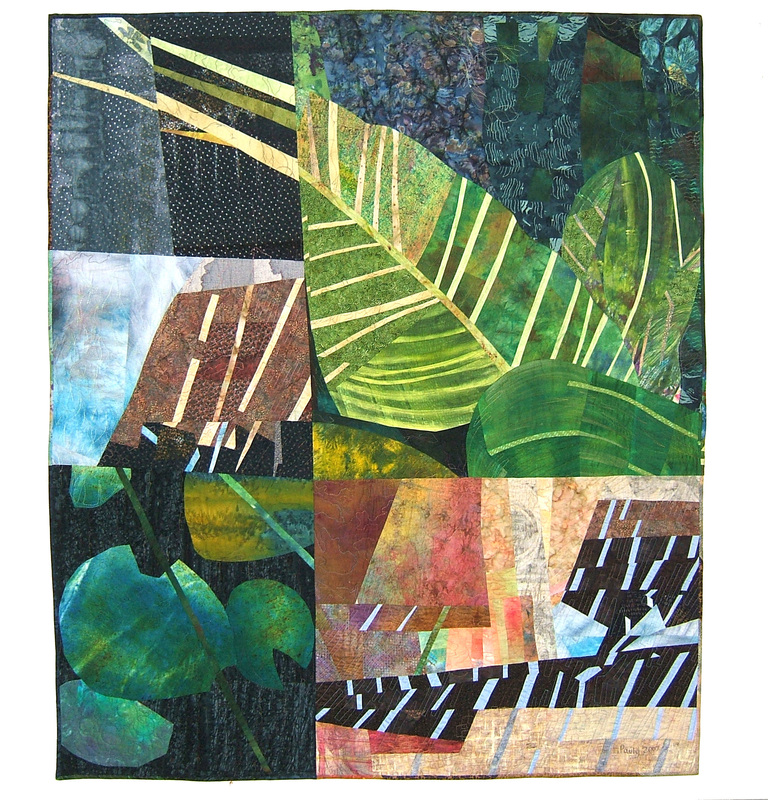 Her art quilts evokes natural and graphic forms, updated in a contemporary key. 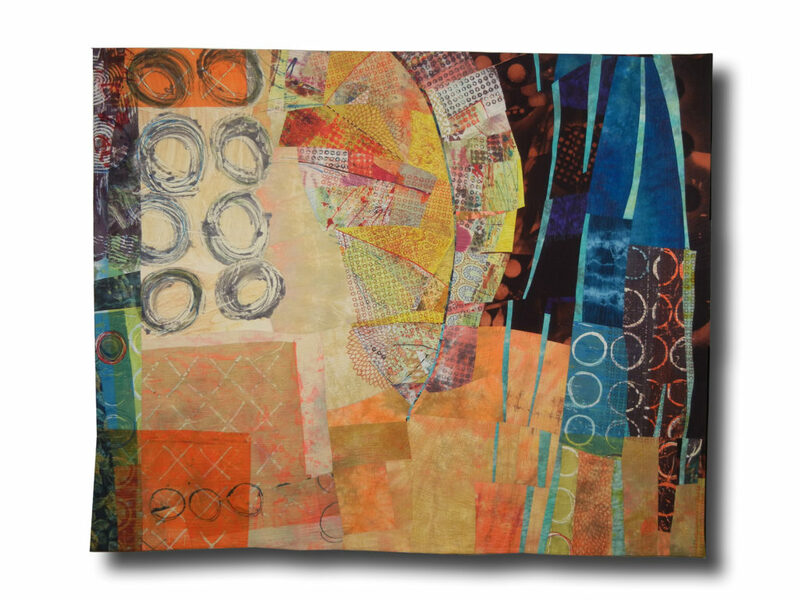 I often ask this question to the artists I have the pleasure of interviewing: why did you choose textile materials as the medium for your art? College studies had me pegged as a painter. 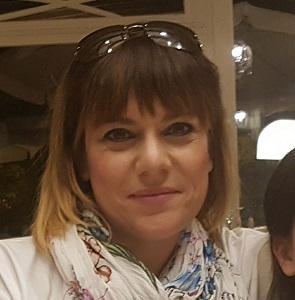 But my interests included graphic design and furniture, so a good foundation in both two-dimensional and three-dimensional design. 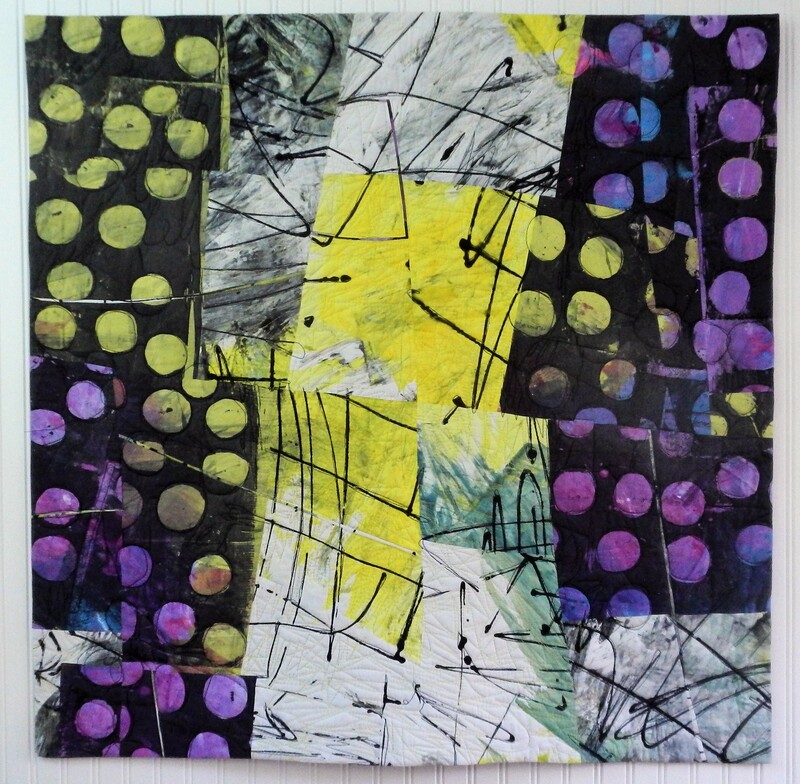 The ability to move part of the image – whether it be parts of a collage or reconfiguring a sculpture – intrigued me. 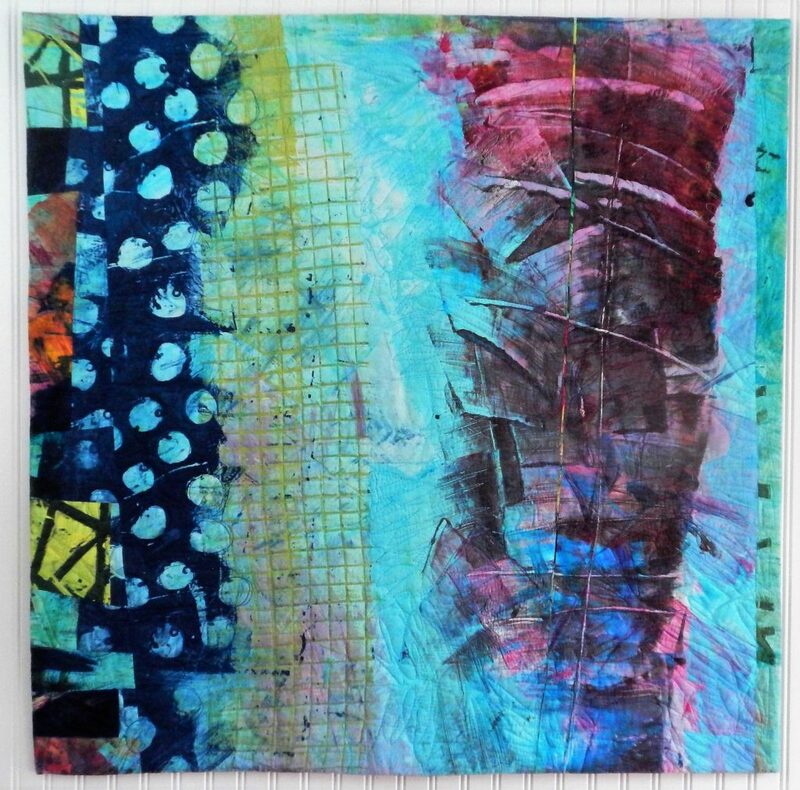 The ability to reconfigure my canvas, or to reconstruct the image, is found in improvisational piecing. 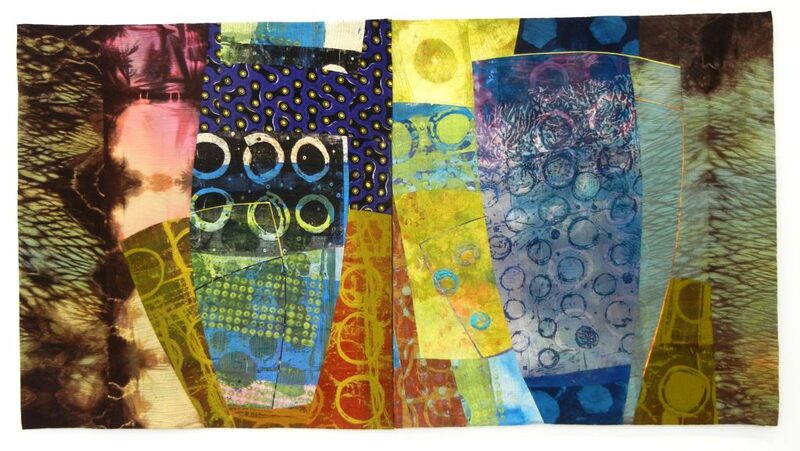 So, working in textiles fits my need for painting (color, shape) and my desire for construction. 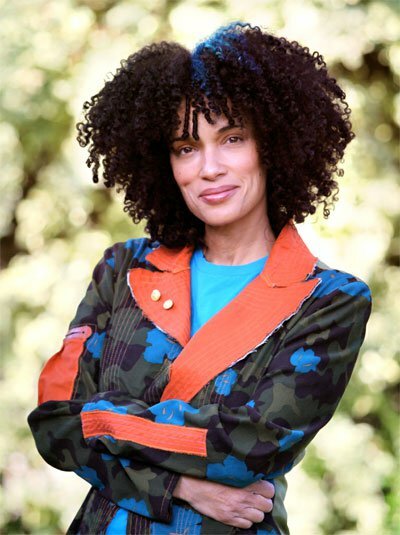 Can you tell us something about yourself and your history as an artist? How did you start? I’ve never been without making something. So, I gravitated to majoring in art, and teaching art. Art was encouraged, promoted, fed. 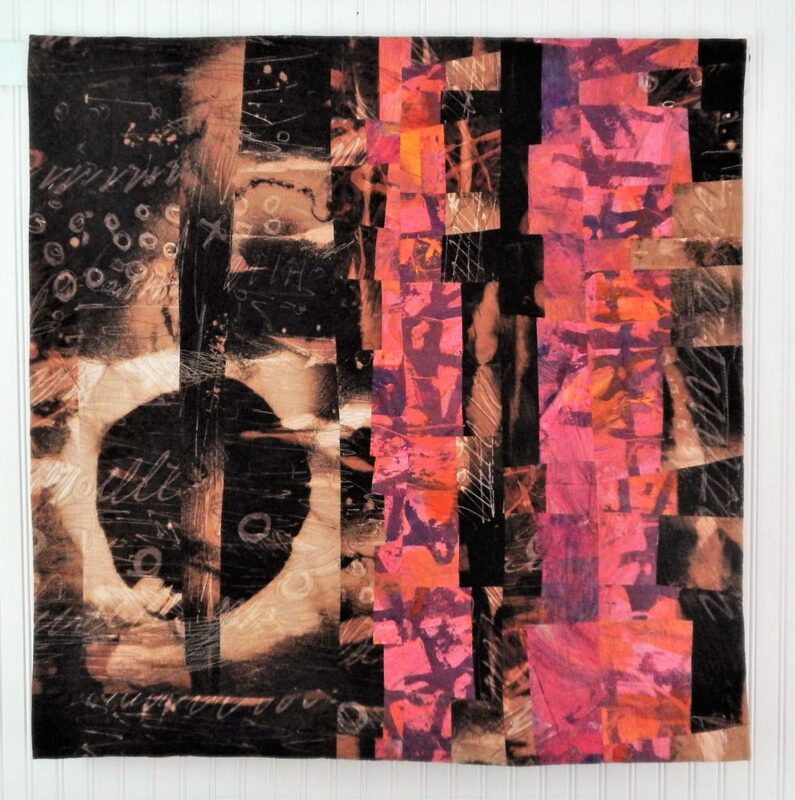 While living in Minneapolis in the early 80s I saw my first art quilt, decided to make one, was juried in to an exhibition (Quilt National ’83), and continued on this path. My works look like paintings, and the biggest compliment is from a fellow painter who claims this work as just that – a painting. 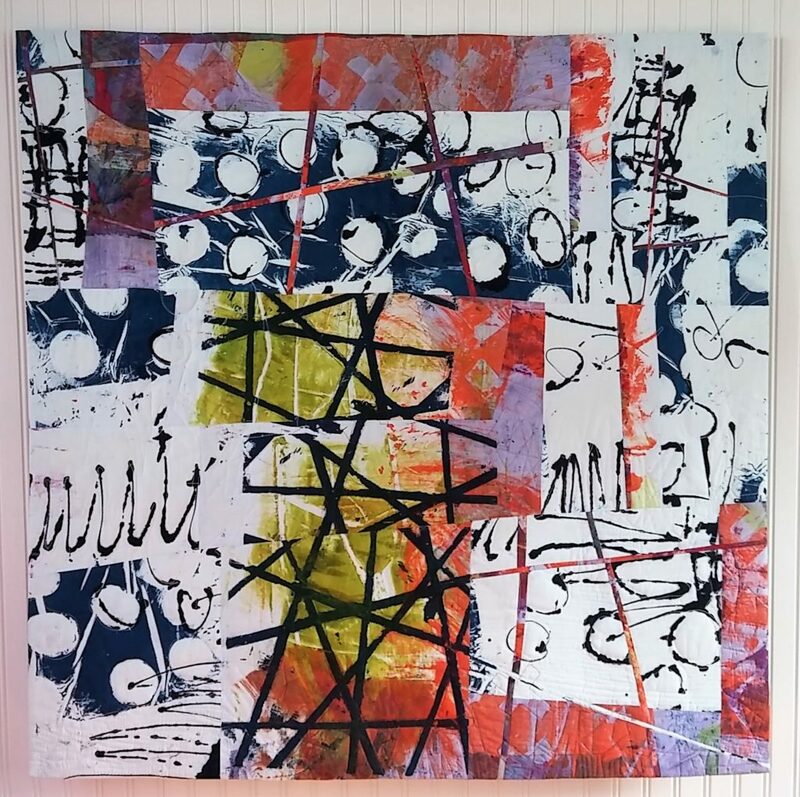 Pat, your personal style of composition is abstract and based on improvisationally. Behind an improv process there is always an idea, a project that guides the artist towards a result that will only be partially “improv”. 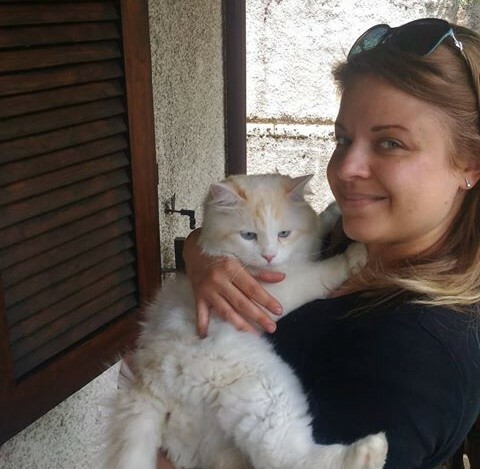 Can you talk about your design method? There is a sensibility for how a work starts. Sometime there is an image that drives the composition (Single Leaf) or a theme (Time of Day: Nine to Five), and at times it is just the material that compels the story (Normandy). Each method calls for a particular way of working, but all coalesce on the design wall. I do build the work there. So, I remind my audience that you must have the largest design wall you can muster because you can only build as big as your wall. 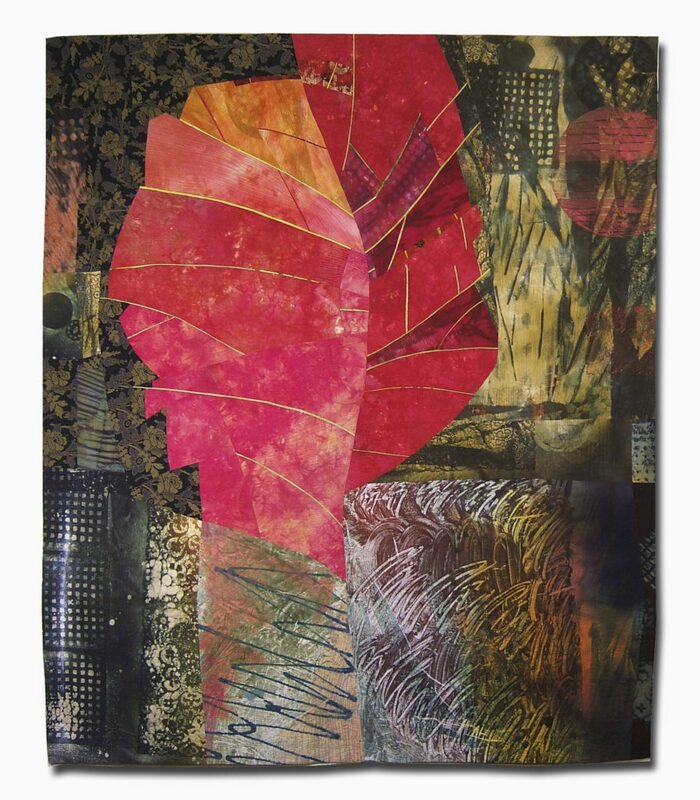 An element that strongly characterizes your artwork is the printing on the fabrics, which you do personally and which is the subject of some of your workshops. Can you talk about it? 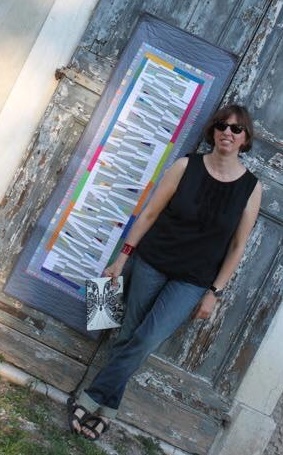 My first quilt was made with silkscreened fabric that I made. I think the colorist in me, the painter side of me, is what is longing for applying color to fabric. 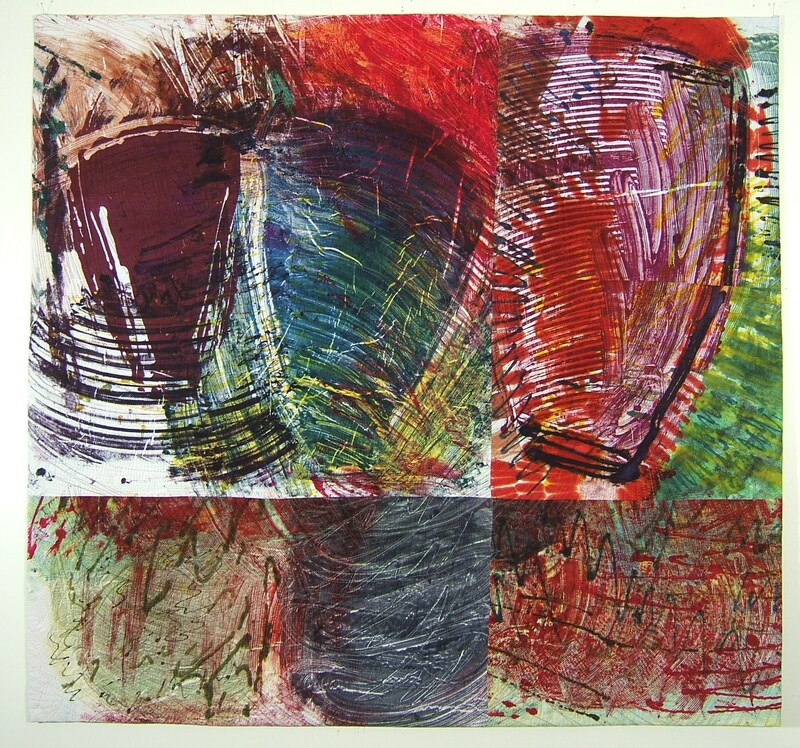 But printing, like silkscreening, monoprinting, and stenciling, speaks to my need for graphics and repetition of motifs. I’m aware of the textures that appear in the designs, the changes in value, and the clean or messy line that I can get. I love making these prints, which may be seen as a finished piece, but that I force myself to cut apart in the hope of gaining a better composition. Now, teaching is where I see a room of people exploding this technique and the energy is fantastic. It is rewarding to see the designs develop. 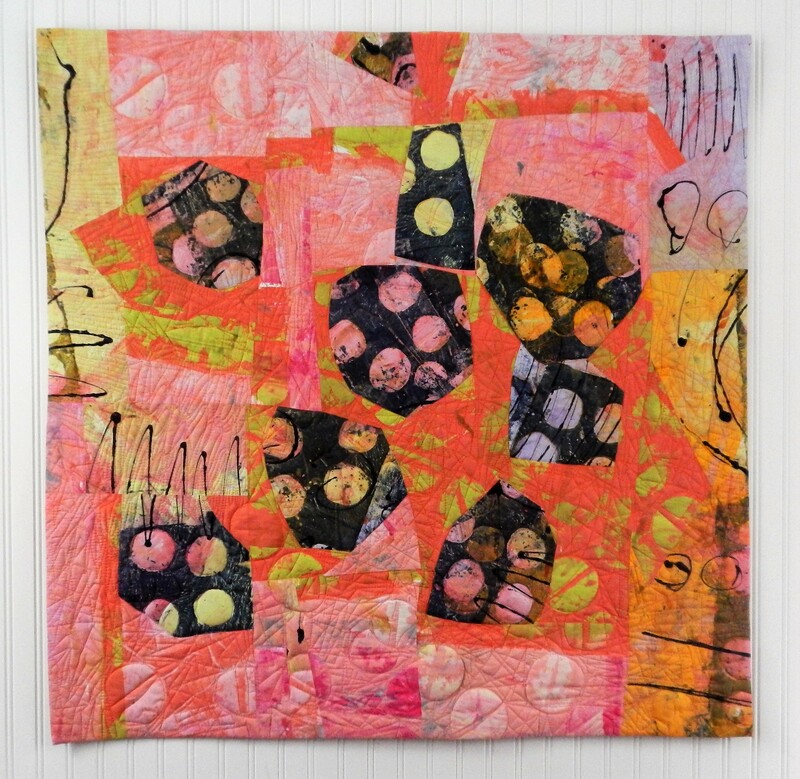 Pat, you give lectures on the evolution of traditional quilting and contemporary fiber art, and the influence of traditional quilts in contemporary design. 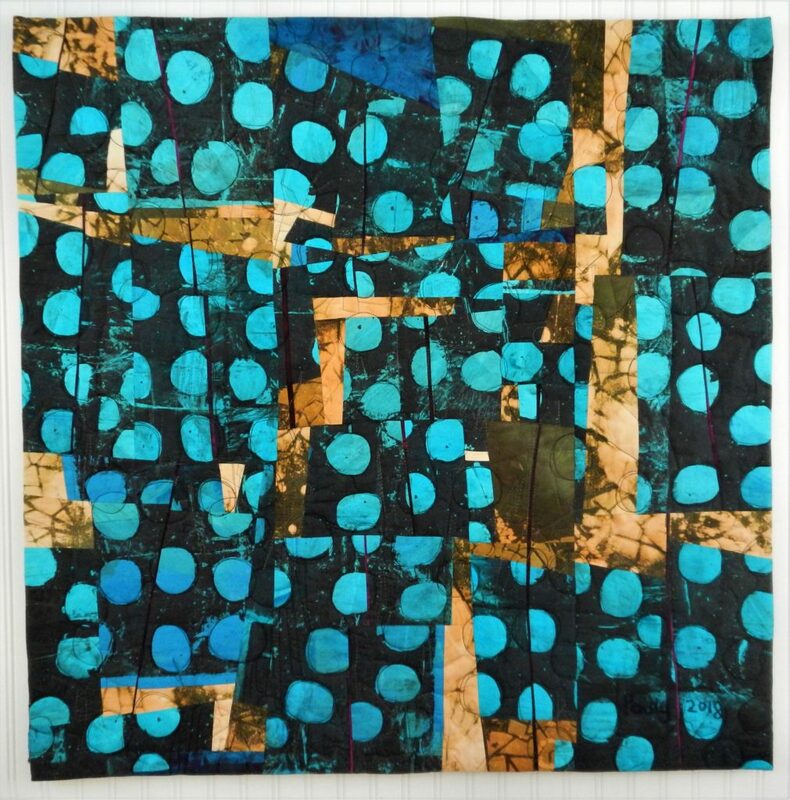 In your contemporary artworks, does the tradition of American quilting still have a role to play? 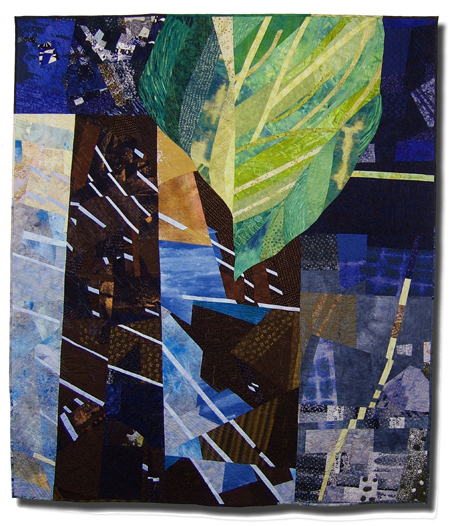 How are your works influenced by traditional quilts? 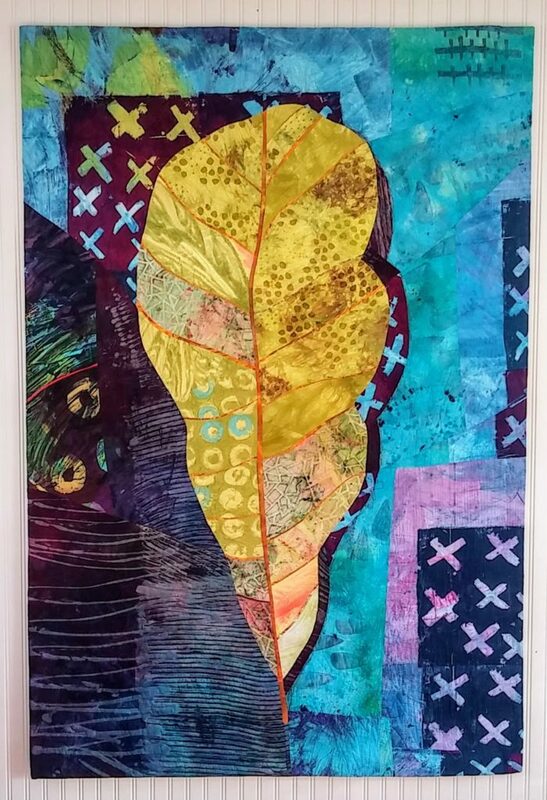 I do see the link between the traditional craft and contemporary fiber art, and not just because they are both using fabrics and textiles. The contemporary art forms follow the functional foundation set down by traditional whole cloth, block, and applique works. The contemporary works just pull out the essentials of the technique and push it far beyond its roots. The link is there, just hiding beneath the surface. But the contemporary works demand you to look at the aesthetic, the design, the relationship of the elements far beyond the obvious. I’m a great fan of historic works because of their delicate craftmanship and strong graphics. 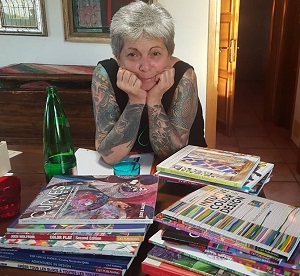 So, when I work, I’m aware of how the design sits with that historic tradition, as well as how it fits in the history of Fine Arts like printmaking and painting. You ask about how traditional works influence my work, and I’ll say that because the works are meant primarily to be functional and are sized to fit a bed, they are by default large. And for my works, I love working large and bold, so that they engulf you should you stand near. 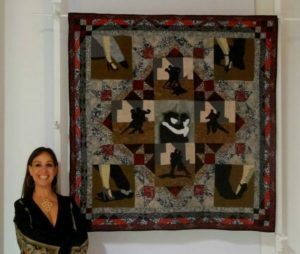 Can you tell us about your “Normandy” artquilt on display at the Quilt National ’17? Normany developed improvisationaly with a selection of fabrics. 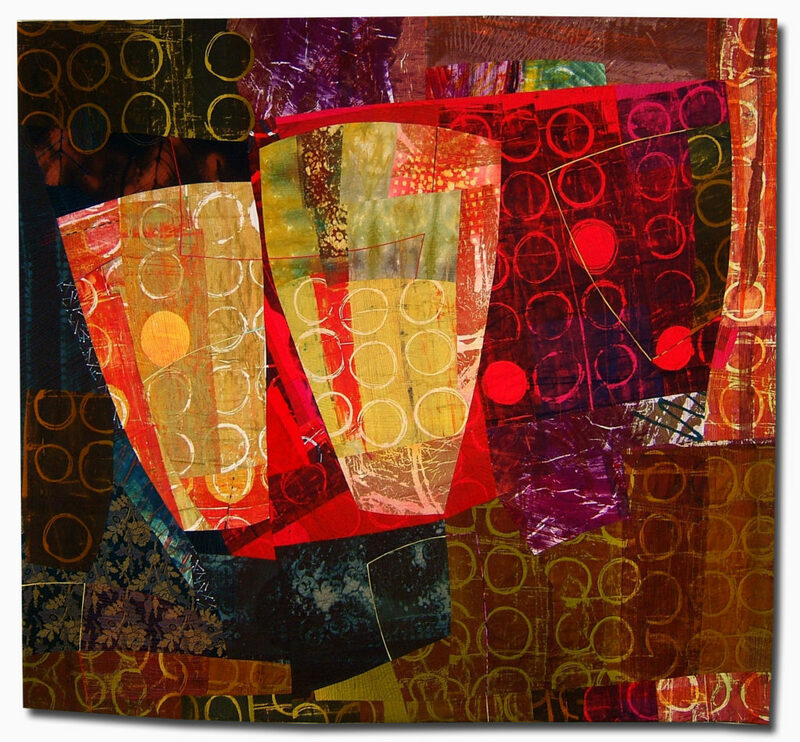 I often put out the “palette” of fabric that I’ll work with, and not return to select more. I meant this piece as a reaction to war, although a personal war, and my original title for it was mundane. A friend, not knowing its theme, saw “Normandy” or more specifically, the Americans landing in WWII at Normandy, and the imagery in the piece spoke to him. Since he referred to war, and my own feelings of conflict, I felt it apt to name it as such. 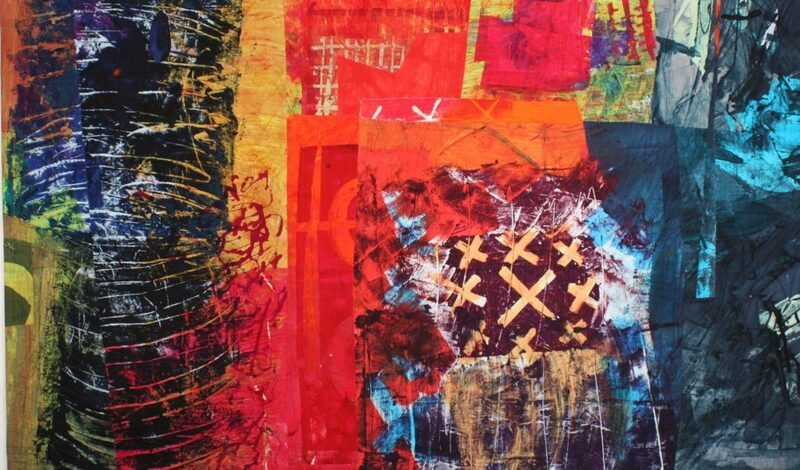 As for your growth as an artist, are there any aspects of your first textile artworks in which you feel you no longer recognize yourself? As I look back on my work I can see the progression, and can claim that my work has not changed in its voice, but rather in its complexity. I know which works are stronger than others, and I pay attention so that the next ones can hold that strength. Pat, you are a tireless teacher, in your workshops you talk about design and compositional techniques. I ask you: first the technique or first the creativity? What do you think determines the perfect success of a work? When does creativity risk being suffocated by technique? This question may be the only one you need to ask! 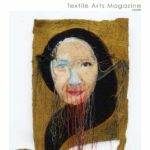 I will read this fiber art as having two parts – one is design and composition (or the creativity and artistry), the other as the technique and workmanship (or the how to make the work). I think that technique and creativity go hand in hand. But often, people have one skill greater than the other. 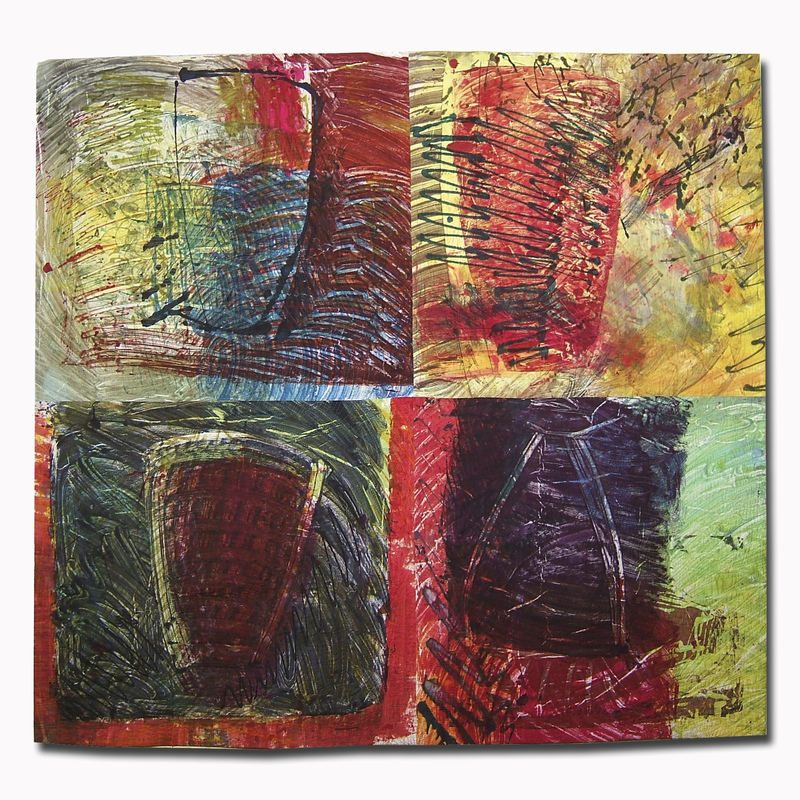 For me, my art background had me comfortable with color theory and design principles. I had sewing skills, but needed to learn the language of quilters. 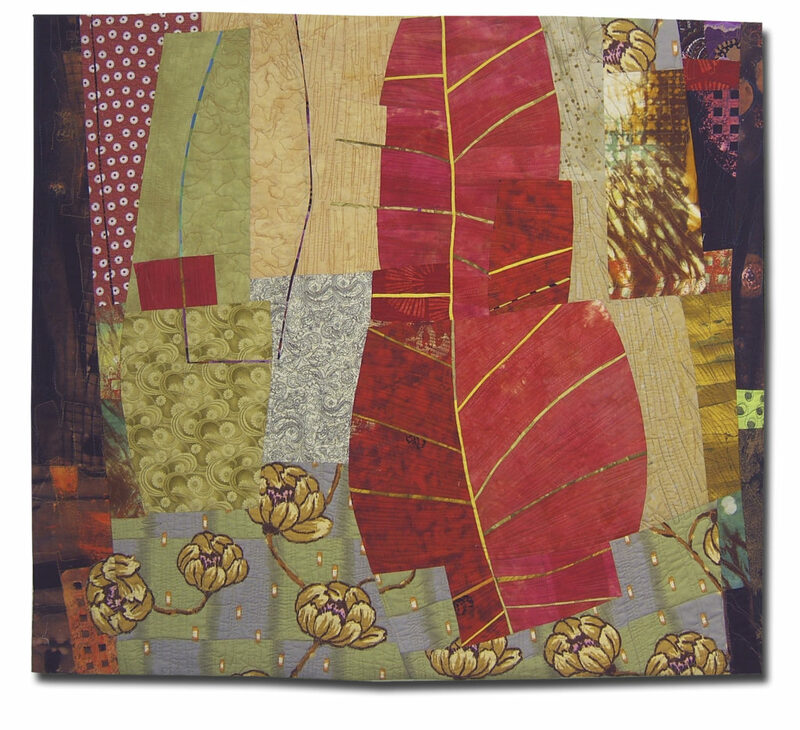 I made many quilts before I ever took a class in quilting. I find that the craftsmanship can be learned easily, the design is more intuitive and difficult to move forward. That said, as I work, my skill set for construction doesn’t hamper the composition or creativity. I know how to construct in many different ways. A work’s success is, for me, the whole. That is, how it reads as an entire work. I’ll not see the details, the little additions, or delicate sewing, or craftsmanship. I’m looking for how powerful the statement is. Does it capture my attention? Is it original? If I’m intrigued, I’ll look more closely and visit the technique for construction and finishing. If technique overwhelms the work, and becomes stronger and more important than the creative elements, I’ll look to see if the design holds its strength, because for me that is most important. But if the workmanship is sloppy, it’s devalued considerably. Both technique and creativity must be there, but artistry comes first. Do you work in series? Why? I find myself returning again to themes. Leaves, Time of Day, Take Two, and Water/ Earth come to mind. The evolution of an idea intrigues me, and how I can portray that idea with different imagery and composition. And it serves as a check for me to see if I can improve or diversify, and still have it be part of the series. What do you think is the most important difference between a craftsman who works with threads and fabrics and a textile artist? When does a fiber work become art? 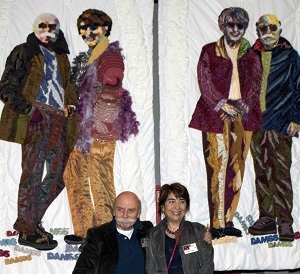 Fiber art, like Fine Art, must hold no intrinsic function other than for its self. Yes, you can fold yourself into one of my quilts, the same as you might hang a painting to block off a doorway. But my fiber art is primarily meant to hang on the wall. 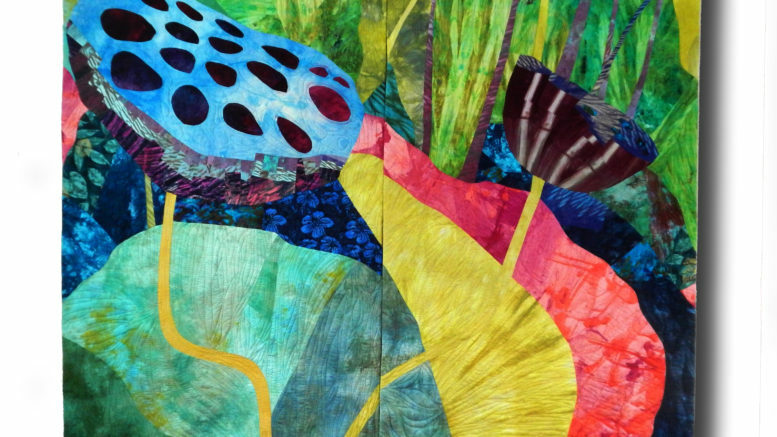 Craftsmanship is a skill set, and a necessity for those who work in textile art, but that skill needs the added design and composition that will move it into the realm of art. So, the medium alone, even if executed skillfully is not a work of fiber art. What are you working on right now? 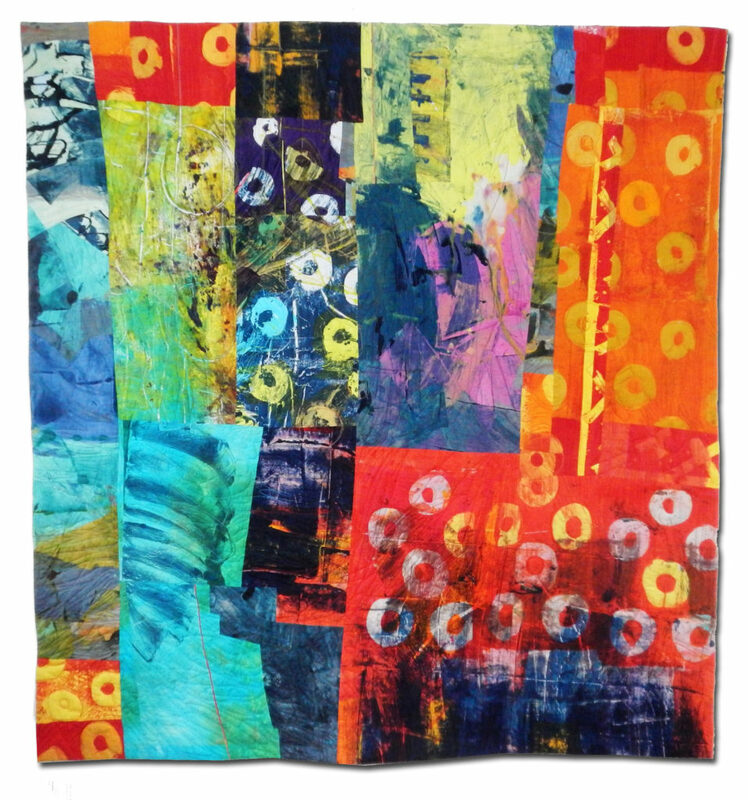 Do you want to tell us about your current textile projects? Take Two is a project where I’ve limited myself to two square meters of fabric with no additional fabrics. Used as a constraint, these two fabrics must do the work for the entire piece to give me shape, line, contrast, movement – well, all the design elements I can muster. 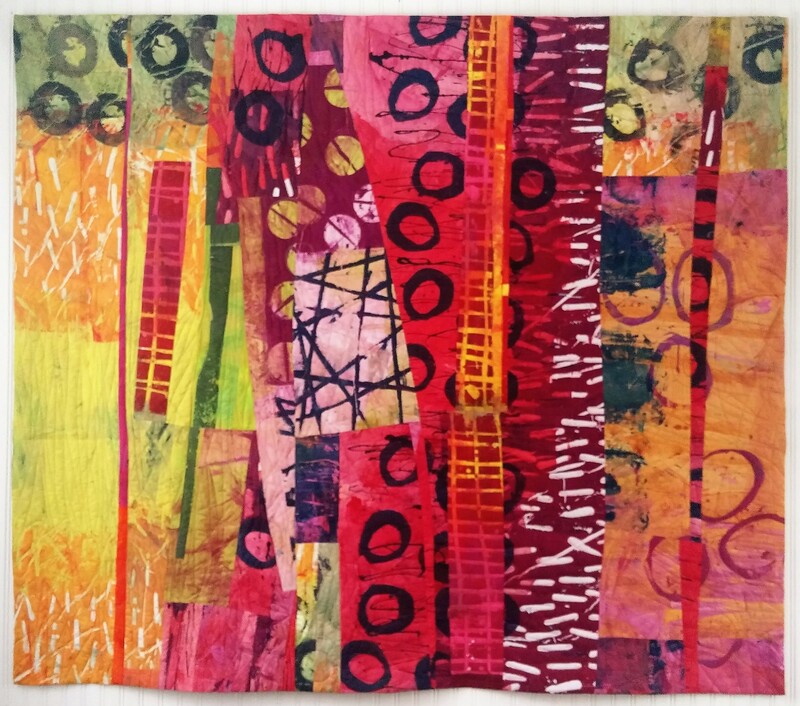 I found that it is a great exercise in composition, where I may choose from traditional patterning like whole cloth, nine patch, overall – and see how to work with the fabric to achieve that design. It also feeds my delight in printing fabric in bold graphic color. Plus, I love a challenge. 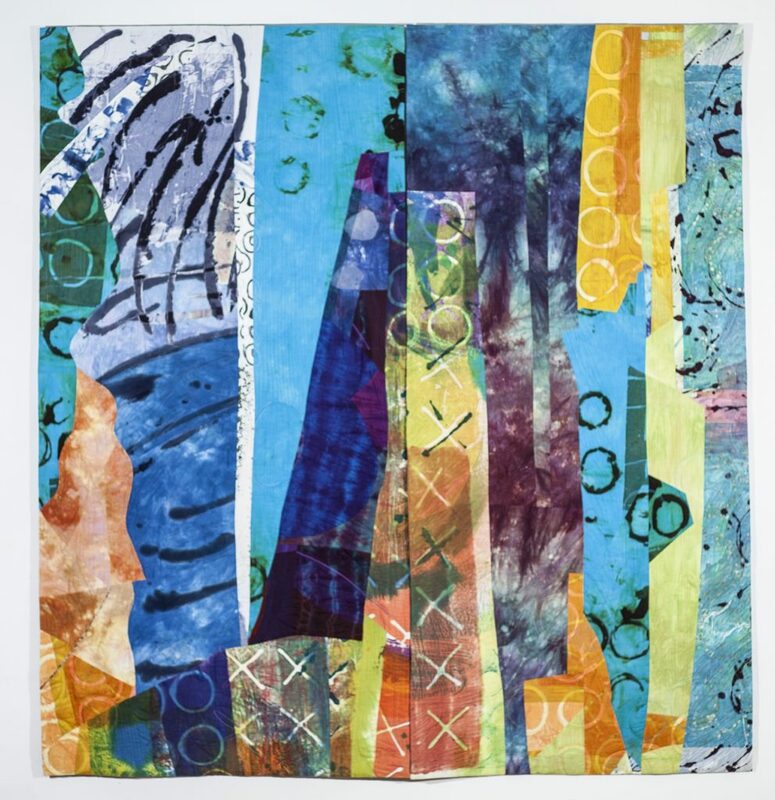 1 Comment on "Interview with Pat Pauly"
Genuine and unpretentious, full of laughter, joy, and energy, I know this woman from my quilt guild in Rochester, NY. 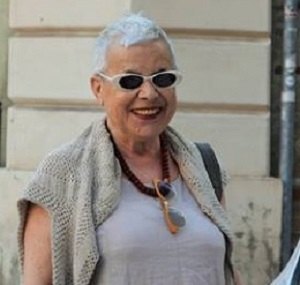 I am impressed that she still takes the time out of her busy schedule to attend meetings and participate in club events. We are greatly inspired by her and learn so much from her exhibits in our local bi-annual show and her contributions to the yearly ‘Demo Derby’ meeting where she just recently shared tips on minding the backing we choose for a project and strategies for hanging quilts for display purposes. She’s a dynamo!